Background: Trochanteric fractures of femur like intertrochanteric and subtrochanteric fractures are a leading cause of hospital admissions in elderly people. Conservative methods of treatment results in malunion with shortening and limitation of hip movement as well as complications of prolonged immobilizations such as bed sores, deep vein thrombosis, and respiratory infections. This study is done to analyze the surgical management of trochanteric fractures of the femur using a proximal femoral nail (PFN). 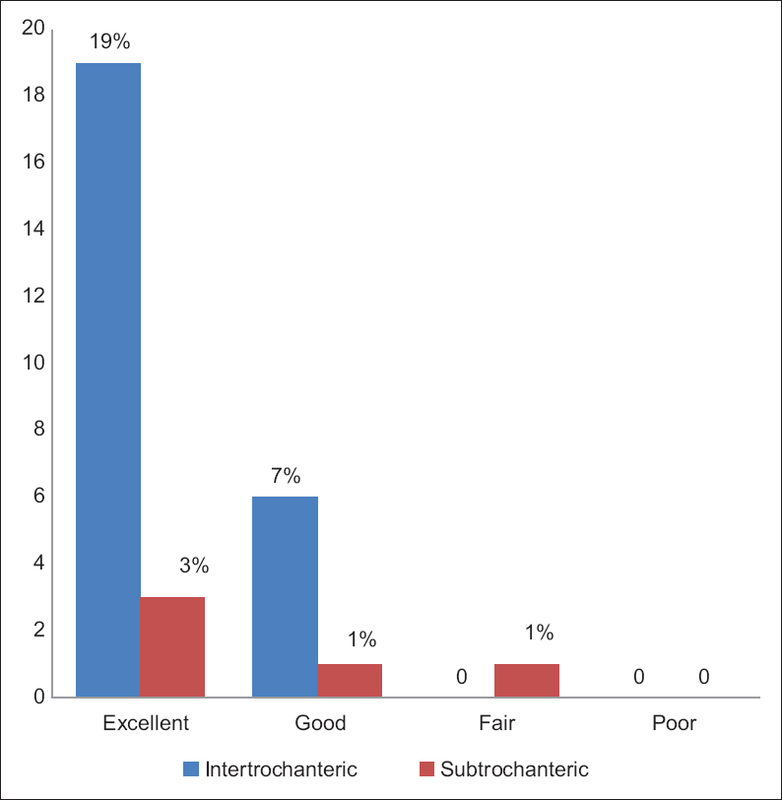 Methodology: This is a prospective study of 40 cases of trochanteric and subtrochanteric fractures admitted to Government General Hospital, Vijayawada, Andhra Pradesh. Cases were taken according to inclusion and exclusion criteria, i.e., patients with trochanteric fractures femur above the age of 20 years. Medically unsuitable, open fractures and patients not willing for surgery were excluded from the study. Results: Forty percentage of cases were admitted due to slip and fall and with a slight predominance of the right side. Out of 40 cases, 26 were trochanteric, and 14 were subtrochanteric. In trochanteric class, 37.5% were body and griffin Type 2, in subtrochanteric class 12.5% were sinsheimer Type 3a and 10% were 2b. Out of 30 remaining cases, 25 were trochanteric, and 05 were subtrochanteric. Good to excellent results are seen in 100% cases of trochanteric fractures and 90% cases in subtrochanteric fractures. Conclusion: From this sample study, we consider that PFN is an excellent implant for the treatment of pertrochanteric fractures. The terms of successful outcome include a good understanding of fracture biomechanics, proper patient selection, good preoperative planning, accurate instrumentation, good image intensifier, and exactly performed osteosynthesis. Fractures of the proximal third femur and hip are relatively common injuries in adults. These fractures are associated with substantial morbidity and mortality; 30% of elderly patients die within 1 year of fracture. After 1 year, patients seem to resume their age-adjusted mortality rate. Trochanteric fractures are common in the elderly people. The frequency of these fractures has increased due to, the increasing life span and more sedentary lifestyle brought on by urbanization. Trochanteric fractures occur in the younger population due to high-velocity trauma, whereas in the elderly population it is most often due to trivial trauma. Even though the location of the fracture is similar, the differences in low-velocity and high-velocity injuries in older compared with younger patients outweigh this similarity. High-velocity injuries are more difficult to treat and are associated with more complications when compared to low-velocity injuries. There are various forms of internal fixation devices used for trochanteric fractures; of them the most commonly used device is the dynamic hip screw with side plate assemblies. This is a collapsible fixation device, which permits the proximal fragment to collapse or settle on the fixation device, seeking its own position of stability. Proximal femoral nail (PFN), which is also a collapsible device with added rotational stability, is the latest device for the management of trochanteric fractures. This implant is a centromedullary device; biomechanically more sound can be performed with a small incision and minimal blood loss. In spite of the advances in anesthesia, nursing care and the surgical techniques, hip fractures remain a significant cause of morbidity and mortality in the elderly population. In view of these considerations, the present study of surgical management of proximal third fractures of the femur is taken up. The following observations were made from the data collected during this study of PFN in the treatment of 40 cases of extracapsular trochanteric fractures of the femur includes in the Department of Orthopaedics, Government General Hospital and Siddhartha Medical College, Vijayawada, between August 2011 and September 2013. Patients who had exracapsular trochanteric fractures; patients aged above 20 years. Pathological fractures; fractures in children; old neglected fractures; peri-prosthetic fractures; open fractures. After the patient with trochanteric or subtrochanteric fracture was admitted to hospital all the necessary clinical details were recorded in proforma prepared for this study. After the completion of the hospital treatment, patients were discharged and called for follow-up at the outpatient level at regular intervals for serial clinical and radiological evaluation. The patients were followed up till fracture union and functional recovery after surgery at regular intervals and if necessary subsequent follow-up was done. As soon as the patient with suspected trochanteric or subtrochanteric fracture was seen, necessary clinical and radiological evaluation done and admitted to the ward after necessary resuscitation and splintage using skin traction. The blood, urine and X-ray investigations were done routinely on all the patients preoperatively. The patient is placed in supine position on a fracture table with adduction of the affected limb by 10-15° and closed reduction of the fracture was done by the traction and internal rotation. The image intensifier was positioned so that anterior-posterior and lateral views of hip and femur could be taken. The patient is then prepared and draped as for any standard hip fracture fixation. 5 cm longitudinal incision was taken proximal from the tip of the greater trochanter. A parallel incision was made in fascia lata, and gluteus medius was split in line with the fibers. In AP view on c-arm, the entry point is on the tip or slightly lateral to the tip of greater trochanter. In lateral view, guide wire position is confirmed in the center of the medullary cavity. Medullary canal entered with a curved bone awl; the guide wire is inserted into the medullary canal. Using a cannulated conical reamer proximal femur is reamed for a distance of about 7 cm. After confirming satisfactory fracture reduction, an appropriate size nail as determined preoperatively is assembled to insertion handle and inserted manually. A 2.8 mm guide wire is inserted through the drill sleeve after a stab incision. Drilling is done over 2.8 mm guide wire until the drill is 8 mm short of the tip of the guide wire. Distal locking is usually performed with two cortical screws. Sterile dressing applied over wound and compression bandage given. Foot end elevation was given. Suture removed on the 10 th postoperative day. Patients were taught quadriceps static exercise and knee mobilization in the immediate postoperative period. Only in very unstable fracture pattern weight bearing was not advised. All patients were followed up at 4, 8, and 12 weeks and then at 6 months and 1 year. At each visit, the patient was assessed clinically regarding hip and knee function, walking ability, fracture union, deformity, and shortening. Hip function was assessed by Harris Hip score. Knee function was graded as: Good - full range of movements; fair-restriction of 25% in any movement: Poor-restriction of more than 50% of movements. In our series, maximum age is 85 years and minimum age 20 years. Most of the patients were between 60 and 80 years. The mean age of 53.9 years. Male = 4; female = 16. Slip and fall - 18; fall from height - 10. Motor vehicle accident t - 12. Right = 22; left = 18. Pertrochanteric fractures are classified according to trochanteric 26 (65%); subtrochanteric 14 (35%)[Table 1] and [Table 2]. In our study, we considered various intraoperative parameters such as duration of radiographic screening-more exposure in case of comminuted fractures with difficult reduction. We took less exposure time in cases of intertrochanteric fracture where the reduction was not a problem. Duration of surgery was more for the initially operated cases. More in cases of subtrochanteric fractures when compared to trochanteric fractures and in fractures where we had to do the open reduction. The mean duration of screening 88 s; mean duration of operation 74 min; mean blood loss 120 ml. In our study, we encountered certain complications intraoperatively. In five of our patients, we had to do the open reduction. In another patient, there was an iatrogenic fracture of lateral cortex of proximal fragment, in the same case we were unable to put derotation screw, these complications occurred due to the wrong entry point. In four cases, we failed to achieve anatomical reduction and we failed to put derotation screw in three cases. In three patients, we failed to lock distally. In three more patients, the jig has got mismatched, and we have done distal locking with a free hand technique. We had one occasion of guide wire breakage and drill bit breakage. We had four cases of fixation of a fracture in varus angulation. We had no incidences of jamming of nail or fracture displacement while nail insertion. We had one case with superficial wound infection postoperatively. We have sent for culture and sensitivity and kept on antibiotic accordingly. The infection subsided. We had one case of skin necrosis on medial aspect of operated thigh due pressure necrosis due to excess traction used on a limb against the pelvic post, which is healed with regular dressing. Among the 40 cases three patients were expired before first follow-up and seven cases were lost from follow-up. Among the remaining 30 cases, two patients had decreased knee range of motion (ROM) who had ipsilateral supracondylar fracture femur and fracture shaft tibia treated with dynamic compression screw (DCS) and intramedullary interlocking (IMIL) nailing, respectively. Patients improved to some extent after rigorous physiotherapy. However, some residual loss of ROM present. We had one case with reverse Z-phenomenon. That was managed with screw removal after 3 months. We encountered two cases of delayed union and four cases of mal-union. One case had shortening of 2 cm who was treated with sole raise. We had no cases of nonunion or implant failure or cutting out of screws [Table 3]. In our study, the average duration of hospital stay was 19.46 days. The mean time for full weight bearing was 11.8 weeks. All patients experienced a good range of hip and knee ROM except two who had associated ipsilateral femur and tibial shaft fracture. Postoperative mobility was aided in the immediate postoperative period but later all patients were ambulatory independently with or without walking aid after 6 weeks. All patients were followed at 4, 8, and 12 weeks, 6 months and some patients' up to 1 year and further if necessary. Seven patients failed to attend the first follow-up and were lost for follow-up. At each follow-up radiograph of operated hip with upper half femur was taken and assessed for fracture union and implant failure and screw cut out. Assessed based on Harris Hip scoring system adopted. Totally disabled, crippled, pain in bed, bedridden (0). Two crutches or not able to walk (0). Bed and chair only (0). Unable to sit comfortably in any chair (0). Unable to do stairs (0). Limb length discrepancy <3.2 cm (yes, no). In our series of 40 operated cases three cases expired before first follow-up due to associated medical problems and old age. Seven cases were lost for follow-up. Functional and anatomical results are assessed taking the remaining 30 cases into consideration [Figure 1]. The assessment of results were compared by X-ray images of all cases at pre-operative, immediate post-operative and at 6 months follow- up [Figure 2]. The treatment of fractures around trochanreric region of the femur is still associated with some failures. The reasons are a disregard for biomechanics, overestimation of the potentials of new surgical techniques or new implants or poor adherence to established procedures. The high-stress concentration that is subject to multiple deforming forces, slow healing time because of the predominance of cortical bone, decreased vascularity, high incidence of complications reported after surgical treatment compels the surgeon to give a second thought regarding the selection of the proper implant. The most common current modes of fixation are blade plate systems, sliding screw systems, and intramedullary devices. From the mechanical point of view, a combined intramedullary device inserted by means of minimally invasive procedure seems to be better in elderly patients. Closed reduction preserves the fracture hematoma, an essential element in the consolidation process. Intramedullary fixation allows the surgeon to minimize soft tissue dissection thereby reducing surgical trauma, blood loss, infection, and wound complications. Allowing a minimally open approach, intramedullary nailing is closely linked to "biological internal fixation." PFN is a novel, modern intramedullary implant based on experience with the gamma nail. The currently used gamma nail as an intramedullary device also has a high learning curve with technical and mechanical failure rates of about 10% (collapse of the fracture area, cut out of the implant, fracture of the femur shaft). The gamma nail is susceptible to fail at its weakest point, the lag screw implant interface. The arbeitsgemeinschaft fur osteosynthesefragen in 1996 therefore, developed the PFN to reduce the risk of implant related complications. In addition to the 8 mm load bearing femoral neck screw, the PFN has a 6.5 mm antirotation screw to increase the rotational stability of the neck fragment. An anatomic 6° neck valgus bend in the coronal plane, a narrower distal diameter and distal flexibility of the nail eliminates the need for routine reaming of the femoral shaft and also minimizes stress concentration and tension in the femoral shaft. Jiang et al. recommended that the lagscrew of PFN should be placed in the lower part of the femoral neck close to the femoral calcar, with screw tip reaching the subchondral bone 5-10 mm below the articular cartilage in anteroposterior view. In lateral view, it should be placed in the center of the femoral neck. There, the lag screw will be definitely placed in the area of best bone quality. PFN has all advantages of an intramedullary device, such as decreasing the moment arm, can be inserted by closed technique, which retains the fracture hematoma an important consideration in fracture healing, decrease blood loss, infection, minimizes soft tissue dissection, and wound complications. Simmermacher et al.,  in a clinical multicentric study, reported technical failures of PFN after poor reduction, malrotation, or wrong choice of screws in 5% of the cases. In our study, poor reduction occurred in cases, four with varus malreduction. A cut out of the neck screw occurred in 0.6% cases in the study conducted by Simmermacher, but we did not encounter such complication in our study. Anatomical fracture reduction was found in 86% of the patients, and full weight-bearing stability was achieved in 94%. In our study, the acceptable anatomical reduction was obtained in 90% cases but we have done an open reduction in five cases. An intraoperative fracture displacement during the manual introduction of the nail into the femoral shaft has not been reported with the gamma nail, but this has been a problem with the PFN. One reason may be that the entry point of the PFN at the tip of the greater trochanter is located directly in the fracture region which can cause an intraoperative fracture displacement. However, Simmermacher et al. had no cases of intraoperative fracture displacement using the PFN. In our study, we had no case of intraoperative fracture displacement after nail insertion. In comparison to gamma nail, we found no fracture of the femoral shaft and no break in the implant. In our study, pertrochanteric fractures were more common due to slip and fall. Age ranged from 20 to 85 years with mean age of 53.9 years. Males were more common contributing 60% of cases. Right sided fractures were slightly more common in our study accounting for 55% of cases. In our study, trochanteric fractures contributed 65% of cases, out of which boyd and griffin Type 1 consisted of 5%, Type 2 of 37.5%, Type 3 of 17.5%, Type 4 of 5% and 30%. Subtrochanteric fractures accounted for 35% of cases out of which seinsheimer Type 3a consisted of 12.5%, followed by 2b of 10%, 2c of 5%, 1 of 2.5%, 2a of 2.5%, and 3b of 2.5%. The mean duration of radiation exposure was 88 s, the mean duration of surgery was 74 min and mean blood loss was 120 ml. In the intraoperative period, one patient had a fracture of lateral cortex of the proximal fragment, in six cases we had to do open reduction; there was one case of drill bit breakage and one case of guide wire breakage. We were unable to put derotation screw in three cases. We had one case with reverse Z-phenomenon. We have removed the screw after 3 months (reoperation rate of 2.5%). The mean duration of hospital stay was 19.46 days; mean time for full weight bearing was 11.8 weeks. Postoperatively, all patients were ambulatory of which seven of them required walking aids. One patient had 2 cm shortening after fracture union which was treated conservatively by the sole rise. All patients enjoyed a good range of hip and knee motion except in two who had the stiffness of knee due to associated ipsilateral supracondylar fracture femur and fracture shaft tibia, treated with DCS and IMIL nail, respectively. In a study by Boldin et al.,  bony union 100% in 4 months and 10% open reduction were observed. In a study by Taglang and Favrel,  bony union 100% in 9 months; 11% failure of fixation were observed. In a study by Menezes et al.,  bony union 99% in 6 months; failure of fixation 2%; delayed union 0.7%; and open reduction 1.3% were observed. In a study but Jiang et al. bony union 98% in 6 months; delayed union 2%; open reduction 34.6% were observed. Whereas in the present study, bony union 100% in 6 months; failure of fixation 0%; delayed union 6.66%; open reduction 15% were observed. In our study, three cases expired before first follow-up due to old age and associated medical problems. Seven cases were lost for follow-up. Overall 90% of our cases had excellent to good results. In the present study of 40 patients with extracapsular trochanteric fractures of the femur (which includes 26 intertrochanteric, 14 subtrochanteric) were surgically managed with PFN fixation. As the incidence of comminution is high, these fractures may require a stable reduction and internal fixation. PFN has the advantage of collapse at the fracture site and is biomechanically sound as it is done by closed technique, fracture opened only when closed reduction could not be achieved, and it is an intramedullary device. Another advantage of this device is it prevents excess collapse at fracture site thus maintaining neck length. Osteosynthesis with the PFN offers the advantages of high rotational stability of the head-neck fragment. The two neck screws should be placed in the center of neck and head, the proximal one act as derotation screw and the distal one as collapsing screw. Postoperatively early mobilization can be begun as the fixation is rigid and because of the implant design. Hence, it was concluded that, though the learning curve of this procedure is steep, with proper patient selection, good instrumentation, image intensifier and surgical technique, PFN remains the implant of choice in the management of proximal third fracture of the femur. Bucholz RW, Heckman JD, Court-Brown CM. Rockwood and Green′s Fractures in Adults. 6 th ed., Vol. 2. Lippincott Williams & Wilkins, 2010. 1827-44. Lavelle DG. : Fractures and Dislocations of the Hip. Campbell′s Operative Orthopaedics-Ed Canale ST, Beaty JH; Mosby Elsevier 11 th ed. 2008; 3 (52):3237-3271. Mclaunn TM, Lawler EA. Treatment modalities for subtrochanteric fractures in elderly. Techniques in Orthopaedics. Vol. 19. Philadelphia: Lippincott Williams and Wilkins Inc.; 2004. p. 197-213. Magit DP, Medvecky MJ, Baumgaertner MR. Intramedullary nailing for the management if intertrochanteric and subtrochanteric geriatric fractures. Techniques in orthopaedics 2004;19:153-162. Pajarinen J, Lindahl J, Michelsson O, Savolainen V, Hirvensalo E. Pertrochanteric femoral fractures treated with a dynamic hip screw or a proximal femoral nail. A randomised study comparing post-operative rehabilitation. J Bone Joint Surg Br 2005;87:76-81. Jiang LS, Shen L, Dai LY. 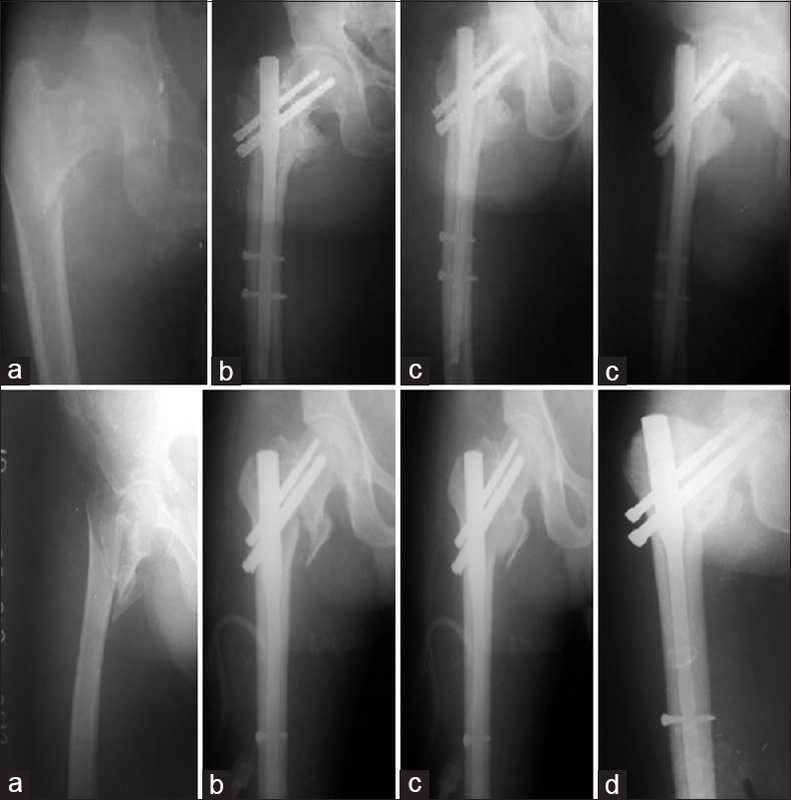 Intramedullary fixation of subtrochanteric fractures with long proximal femoral nail or long gamma nail: Technical notes and preliminary results. Ann Acad Med Singapore 2007;36:821-6. Boldin C, Seibert FJ, Fankhauser F, Peicha G, Grechenig W, Szyszkowitz R. The proximal femoral nail (PFN) - A minimal invasive treatment of unstable proximal femoral fractures: A prospective study of 55 patients with a follow-up of 15 months. Acta Orthop Scand 2003;74:53-8. Taglang G, Favrel E. "77 patients, mean age 75 years, one year follow up". Paper presented to advanced course in intramedullary locking nailing, Courchevel, France; 1991. Menezes DF, Gamulin A, Noesberger B. Is proximal femoral nail a suitable implant for treatment of all trochanteric fractures? 2005;439:221-227 .